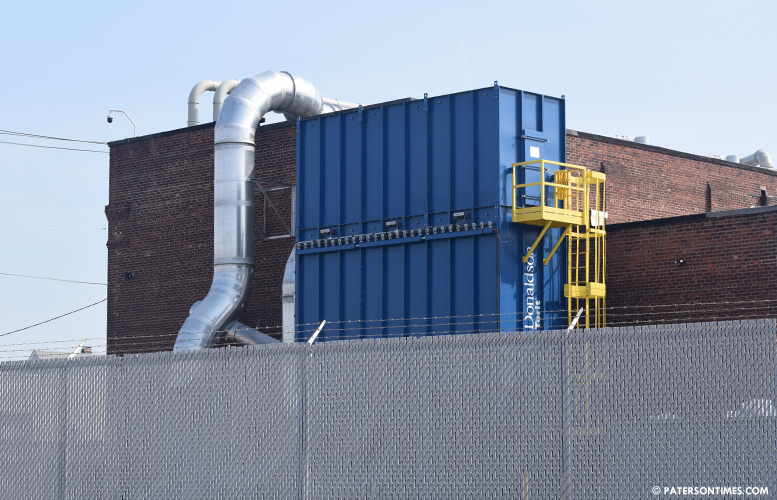 A property owner in the Wrigley Park neighborhood claims a metal processing facility next door is releasing pollutants into the air. Murad “Dave” Civan, owner of 212 Franklin Street, alleges his neighbor, U-Metal LLC, a copper wire stripping business at 219 Lafayette Street, has made it impossible for him to operate his used car dealership. Civan alleges the facility makes excessive noise, emits a noxious odor, releases copper dust into the air, and causes his building to vibrate when the wire shredding machines are in operation. Civan said the dust coming out of the plant is making him ill.
“He has made many, many allegations. It has really gotten out of hand,” said John Albin Tavolacci, a principal of U-Metal. Tavolacci called the allegations “unfounded.” But a reporter observed dust being picked up by wind from a large receptacle at the plant on Mar. 23. “We have a receptacle in the parking area that’s a dust collecting unit. It collects the dust and expels it out the bottom. If you saw dust flying around, I’d like to know how you know it’s coming from us. I’d like to know how much of it came and I’d like for you to show me,” said Tavolacci. Tavolacci said his firm is willing to address all problems at the plant. He said the company has a state-of-the-art air filtration system. He pointed out the firm uses cutting edge American and German technology for its operations, mainly splitting rubber and copper from electronic cables. Tavolacci claimed Civan has been targeting the plant after a potential property deal fell through. Tavolacci said his company was prepared to purchase Civan’s property for $300,000. However, Civan wanted $500,000. Civan has lodged complaints with state, county, and municipal agencies. Municipal health inspectors visited the site after he complained about odor and noise. Inspectors did not find any violations. Passaic County health inspectors visited the plant more than 10 times over the past month after Civan filed complaints. A county inspector said no violations were observed during those visits. A building inspector also visited the plant, but did not find any violations. “They’re all doing nothing,” said Civan. A Passaic County inspector said Civan threatened to assault him during an inspection prompting sheriff’s officers to respond to the site. A municipal inspector said Civan has been harassing him. Civan denied threatening or harassing inspectors. Civan has a harassment conviction from 2006. In that case he was charged with making harassing remarks to a pastor by telephone, according to judiciary records. Civan has also complained about the plant’s hours of operation. During a Board of Adjustment hearing, Tavolacci said the business would operate from 7:30 a.m. to 4:30 p.m. Monday through Friday, but the plant has been operating the past two Saturdays. Tavolacci said someone at the board asked about his hours of operation. He disclosed the hours for the one shift at the Oct. 2018 meeting. At the same meeting, he said the plant, which employs 12 people, will expand to include a second shift in the future. Tavolacci suggested the board did not impose a condition on hours of operation. Mayor Andre Sayegh did not respond to a request for comment on whether municipal zoning officials looked into Civan’s zoning complaint. Civan said he has owned his property for two decades and did not have any problems until the metal processing facility opened. He’s complaining about this! What about all the drugs, prostitutes, and guns all over the neighborhood?